We love our work and enjoy creating structures for others to enjoy. From houses, extensions, garages and porches to arbours and pergolas, each project is unique and each is lovingly crafted to very high standards of design and workmanship. Above all you can rely on us for honest, friendly advice and a discrete and considerate service. 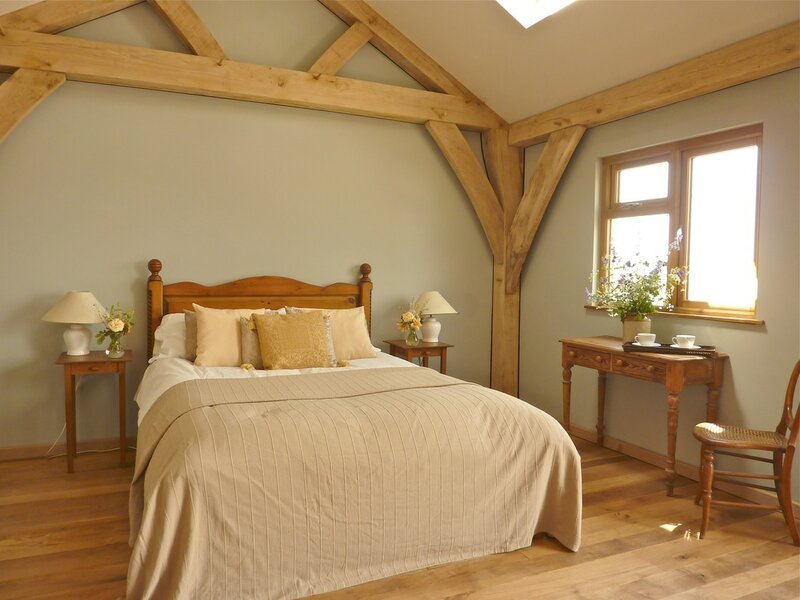 We design and build traditional green oak frames, with mortise, tenon and draw bore pegged joints, using classic construction methods that are centuries old but we pair this with modern construction techniques for contemporary living. We do this for habitable buildings by encapsulating the green oak frames with either insulated walls or a glazing system. In the case of house frames and extensions, the traditional oak structure is completely on show in the room, encased by the exterior insulated walls. With glazed extensions/Garden Rooms and gable frames, the glass units are placed on the outside of the frame (called Face or DIrect Glazing) within an encapsulation system of flexible glazing tapes and stable dried oak coverboards. This gives the look of the glass being rebated but with none of the associated potential air or water leakage issues through the oak frame joints or risk of breakage to the glass units as the oak frame dries and moves. This method of encapsulation is tried, tested and used throughout the timber frame craft and ensures we can carry on the tradition of oak framing whilst complying with modern standards of insulation and Building Regulations. To find out more about the glazing encapsulation go to the FAQs page. Oak frame encapsulated by the glazing. Oak or aluminium can be used. We want to be as clear as possible about everything we do. We write a comprehensive description of the works we are quoting for and, wherever possible, provide you with an illustration of what is included. If there is anything unexpected or you request something in addition we always provide you with a quote first. We are fully insured and are members of the Carpenters Fellowship and the Federation of Small Businesses. At Made In Oak we only source from reputable FSC or PEFC suppliers. We will not compromise on quality or provenance of our timber. 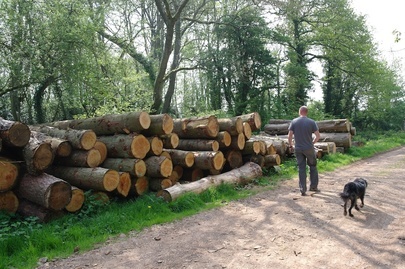 We are also keen to use local timber and will buy suitable logs from responsible, local landowners only where a tree has been wind blown or needs to be felled as part of a woodland management scheme. ​100% renewable energy, supplied by local supplier Ecotricity. Our workshop is heated with a wood-burning stove from the offcuts and the sawdust is also used for heating or for animal bedding or composted and used in local gardens as a mulch/ compost additive. In 2018 we will be investing in a sawdust briquette maker producing logs for home heating. We have our own sawmill so, in some circumstances, can process logs ourselves. The photos below show how we collected, milled and constructed a garden structure with a client's own timber. The structure was then used for their daughter's wedding celebrations.